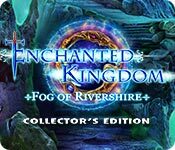 Enchanted Kingdom: Fog of Rivershire Collector's Edition is rated 4.0 out of 5 by 23. Rated 5 out of 5 by rainworm from Beware of this green fog Back in the enchanted kingdom we, the honored healer, are called, as there is an epidemic spreading. Dr. Klein needs our help and as soon as we meet him, the door opens and an apparently ill man enters the room. He is a warrior from Rivershire, where the disease started. After diagnosing him, we recognize the demonic character of the illness. We can heal him, and he reports, what happened in Rivershire. Source of the infection is an ominous fog, it seizes the mind and alters the body of those, befallen. The healer of this village had been infected too and the villagers put him into a cage to prevent him from harming himself. It looks like the disease turns people into monsters. They change in appearance and behavior. All not infected, fled across the river but there they may be not safe for long. Your immunity against magical illness will protect you, as your task is now to help the healer, the villagers and to defeat the source of the infection. Part of the game is of course our medical kit for composition of healing potions, as well as the diagnostic tool. Both features are a substatial part of the series and in this third game we start with using it from the very beginning. The ride to Rivershire will not be boring, as we jump into sort ‘find your way against all obstacles’ puzzle – with easy/hard option, as usual. HOS and puzzles are all variable and entertaining. A choice of difficulty let the player choose the challenge. Still I have the feeling of missing some of the mystery of the former games. The search for the cause of the disease, the originator of the pathogen, is less exciting after we are informed at the very beginning of what triggers the infection. It is a demonic fog. That leaves, finding the source and defeating it. On the other hand, this should be an exiting adventure, as demons were vanquished decades ago. So I’m off on my way through this fantastic world….. Rated 4 out of 5 by yowzasma from This was an okay game but.... I know that a lot of my fellow Fishies in this pond have likes and preferences different than mine so I am not letting my personal like of the minis affect recommend or not recommend. This was an okay game but I personally do not like Mini-games that require me to click my mouse as fast as possible or have one of those 'Fence in the bad chip [or what-ever] and don't let it reach the edge". & believe it or not that was what the last mini-game of the bonus chapter, Grrrrrrrrrrrr ! The graphics, music, voice-overs and basic storyline were good but those 'click-click-click-click-click-click' minis---yuck! Rated 4 out of 5 by Majestyx12 from Monstrosities This is the third one in the series. I like the healing parts. The disease in this game is turning into monsters. The first two have 6 chapters and this one has 5 chapters. My favorite in this series is the first one A Dark Seed. Replay 17 hops and 17 mini-games. Collect 76 coins to purchase things for your lab. Collect 15 medallions- has info. Collect 15 eggs and the best part is watching them hatch. The bonus game has Empress Patricia's father as a child. Rated 4 out of 5 by dancemom1 from Evil crystals! Hello friends! Welcome to another addition to this series. As always, I review mostly on the game play and leave the story line to others who do a much better job than I. Graphics are fairly clear and nice, except when going in and out of close ups and cut scenes, then a bit blurry, as usual. Game play was very nice and I had not glitches or problems during the demo. Colors are very clear and bright, without being blinding. Animation is very well done, except for a little during the opening scene, when the mouth didn't quite match the dialog. Music was quite soothing and very nice background sound. Voices are well done and are age and character appropriate. There wasn't a tremendous amount of character interaction, but enough. Yes, we still heal people infected with the crystal disease, and have the diagnosis lens. Personally, I'd prefer that we just find the written ingredients and forget the lens. I do like using the healer kit, though. I think I'm finally getting the hang of it, as I managed to only have to place items twice to get it correct. Sound FX are nice when we had them. A little more would have really perked up this game. HOPs are varied and very well done, with silhouettes, interactive lists, highlighted words, and place items in the scene. The scenes are fairly clear and uncluttered and items are not difficult to find. You can switch to a match 3 if you prefer. 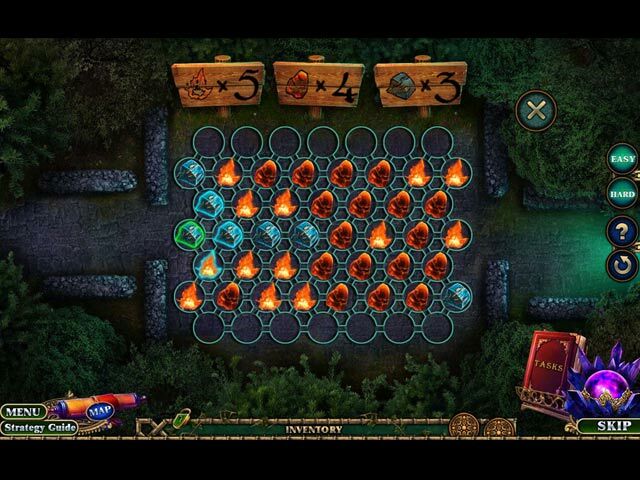 Puzzles were fairly simple, and you can choose between easy and hard. This addition was not overrun with HOPs or puzzles, but had enough to break the monotony of straight game play. As usual, this game has my favorite map. Areas are clearly identified and you can choose to have it tell you if you have missed a collectible or not. The hint system is very helpful, but it doesn't have the usual transport popup. When you need to transport, the map opens and it shows you where the next area is open. There is a lot of back-tracking, so this is a big time saver. Strategy guide is the usual and easy to follow. We have a lot of varied collectibles to find in this addition. We need to find 15 medallions, which are not all that easy to find as you think; 76 coins to buy items for our medical laboratory, which are very easy to miss, and 15 various figurines, which are fairly large but easy to overlook. Love it when we have lots of collectibles to find. I really like how this series picks up where the last one left off. Yes, same story, but still interesting and fun. I didn't see any "inter dimensional" travel, so hopefully we don't have the bright lights we had in the last one. This game is not exceptionally challenging, but I found it interesting enough to want to play it out, and I really like the collectibles. Even at that, I gave it a 4.25 on my rate scale. I think all levels of players will find this one a nice game. Yes, I am adding it to my collection. As always, try it for yourself and see what you think. We all have different tastes in games and you may not care for this one at all. Thanks for the reviews. 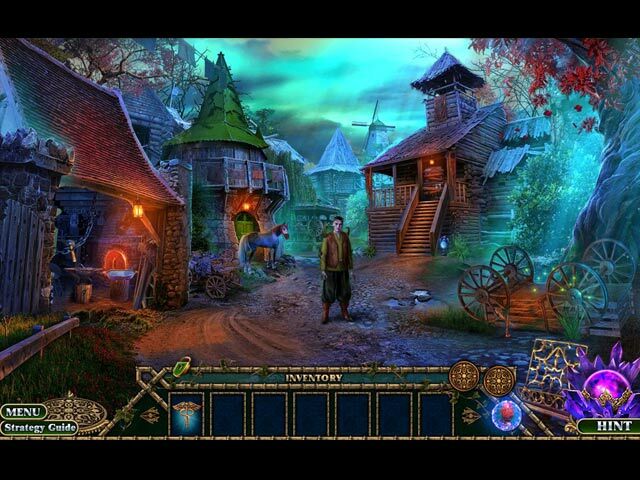 Rated 4 out of 5 by bcorsica from Enchanted, not so much The game was ok, no too much challenge to it, constant repeat of the same kind of potion. I bought it hoping for a little more diversity in the challenges. I still will recommended it but not a game for me. Rated 4 out of 5 by pgillenw from I'm not a fan of fantasy games! Although not a fan of fantasy games, just to many of them dished up. I will play them from time to time. The game was well done and for that I awarded 4 stars. Rated 3 out of 5 by Granny_Gruff from Can I Phone This Review In? This story is so similar to the last entry in the Enchanted Kingdom series, I briefly wondered if I could just use the last review. I decided that was the coward's way out and finished the demo anyway. So magical plague breaks out and turns the citizens into monsters. Locals are abandoning their villages and running from the victims. As the top Healer of the Medico Imperium Order, you are sent by the order's head, Dr Klein, to investigate. You will take your trusty healer's kit and Diagnostic lens and head off for the first village, Rivershire. The local Warrior of Rivershire, Xander, had stumbled into headquarters as you were meeting with Dr. Klein. He was your first successful cure of this outbreak. Go get 'em, Healer! Good stuff: All the usual game elements, including a Match game alternative to the HOPs, collectible coins, eggs, and medallions, along with an assortment of CE bling. Bad stuff: The story is so similar, I checked my game notes thinking I had already played this one! The Healer's kit and Lens have you identify and procure five ingredients for each potion you make. You will need a different potion for each person you cure. There is a mini-game to finish the potion and then they drink it and you move on. The artwork is so overly colored there must be an ink shortage somewhere. And, yes, the scenes still have that distressing fuzz-out in between them. The characters will move their lips when talking, just not in sync with what they say. Bottom line: This is an inoffensive repeat of a general story line with new details. The game play is average, as are the details. Try it, you might like it. Rated 2 out of 5 by Beehead from Enough with the Dark Side already please! Please will Hidden Object games stop already, with the demons, ghosts, occult, devil, and evil as characters and storylines and settings? Enough! I think they think we customers want that because we keep buying the games. But we buy them because that is almost all that anyone creates. I love when games have gorgeous art, soothing music, beautiful pastel colors, something to accomplish that is about being brave or good, and a positive storyline and characters. I tried this one anyway and finished the demo in about a half hour. You get a demo in most game trials now instead of a timed allotment. People were nearly finishing too many games and then not buying the full version. I chose not to buy this game, because the closeups we have to endure to 'heal' the townspeople of their demonic infestations (literally), were so revolting. Great imagination guys but it really looked gross. Most of the story is finding people who have 'infections' resulting in scales, hair, fur, horns poking out all over their body...ugh! Other than that, this game has run of the mill game play. You go from scene to scene finding illogical items and being able to carry a truckload of things in your pocket somehow. 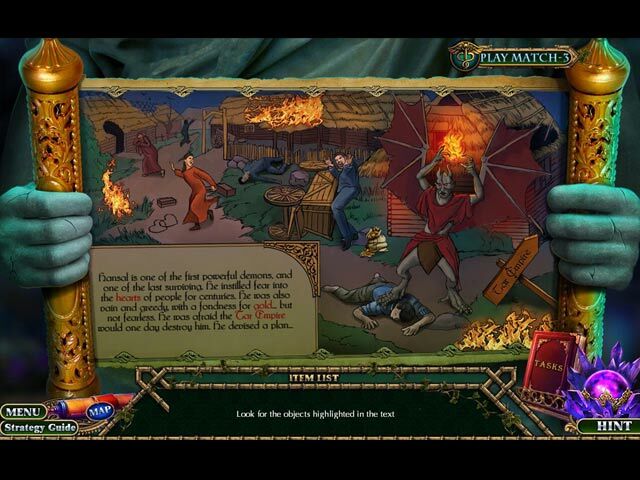 I kept hitting the hint button because as with most hidden object games, the progression is not intuitive. You have to use the same old types of things: spade, flint and stone, axe, saw, etc. etc. Please will someone break the mold already? Thanks! Rated 2 out of 5 by crypsynight from More of the same... The first in the series was enjoyable. The second much the same as the first, making it less appealing, By the third game it becomes a bit tedious. Nothing original. Puzzles and hidden object were very mainstream and average. If you have played the previous game/s in the series this game is exactly the same. Rated 1 out of 5 by jentzie from boring This is just a repeat and bad one at that, of the same old game. Same story line, different background. Hated this game.